Do you check to see if your appliances have been recalled for safety reasons? How do we check if appliances have been recalled? Electrical appliances get recalled all the time, for all kinds of reasons, often simple maintenance issues where if you get in touch with the manufacturer they’ll send an engineer out to do the work, but sometimes it’s because a fault has been found that makes the appliance highly dangerous, like it could overheat and catch fire. If there is a risk of your appliance catching fire surely you’d want to get that checked out pretty quick? I’m a big advocate for completing warranty cards when I buy new appliances and urge anyone to do the same. If you fill in that card and send it to the manufacturer you go on a database; if the machine is recalled you get a letter telling you what to do next. This dishwasher, pictured, was never registered and the owner never checked the lists or even knew it was on the list. This dishwasher was in her flat, a flat she owned and rented out to a tenant. One day, when it was on washing the dishes it overheated so quickly it set itself on fire and this is the result. 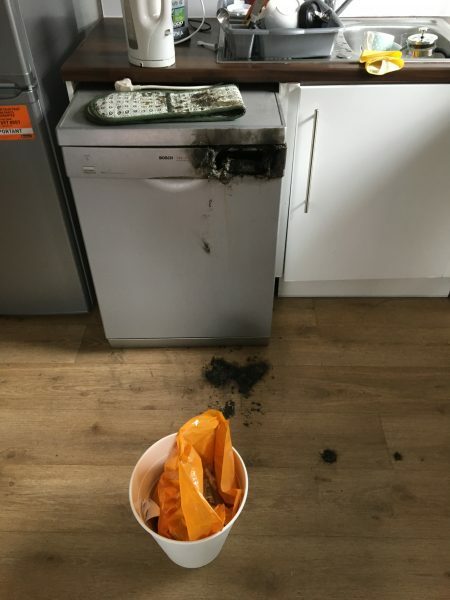 The effects of the fire could have been a lot worse had the tenant not been in the flat at the time, and had been so quick thinking – with the help of an oven glove she was able to bash out the flames and stop the fire spreading. We got to see this dishwasher first hand; had we seen it before, we would have flagged it up to the landlord as being on a safety recall list, as that is something we do for landlords. When we go into properties to maintain their appliances we cross reference them with the product recall lists and notify the landlords. We have had many instances of finding products on these lists. If you want to get your appliances checked for safety including checking them against product recalls visit our landlord information page (for more info) or get in touch. You can check your own products to see if they have been recalled via our product recalls page. By Richard Ayre+|2019-02-02T18:19:01+00:00April 3rd, 2018|PAT Blog|Comments Off on How do we check if appliances have been recalled?